Last week a friend of mine mentioned Easter and I realised it is around the corner and I have no decorations at all to put out. I never really bothered before, mostly because we weren't home during that period, but this year I thought I will change my routine and make an effort to decorate our home with Easter inspired decorations. 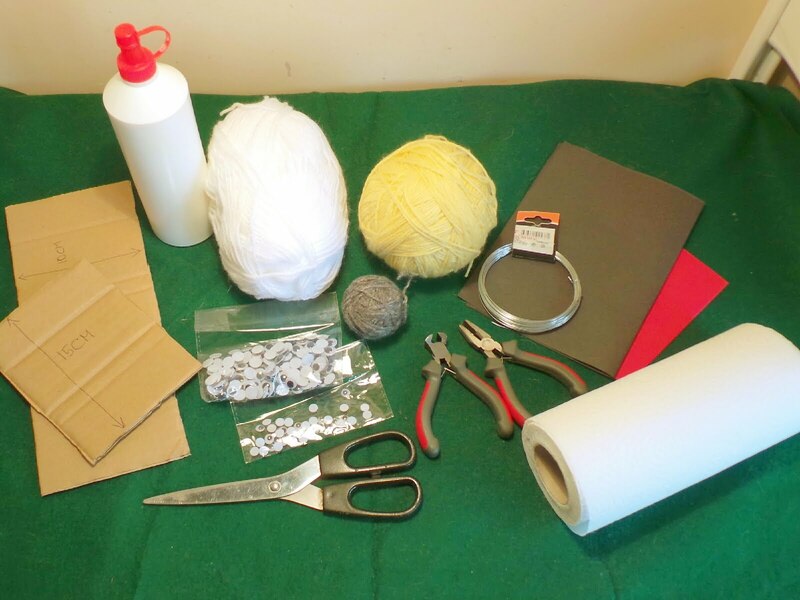 As you know, I try as much as I can not to buy ready made festive decor, I love making my own, it makes each piece unique and special and one of a kind which is important to me. 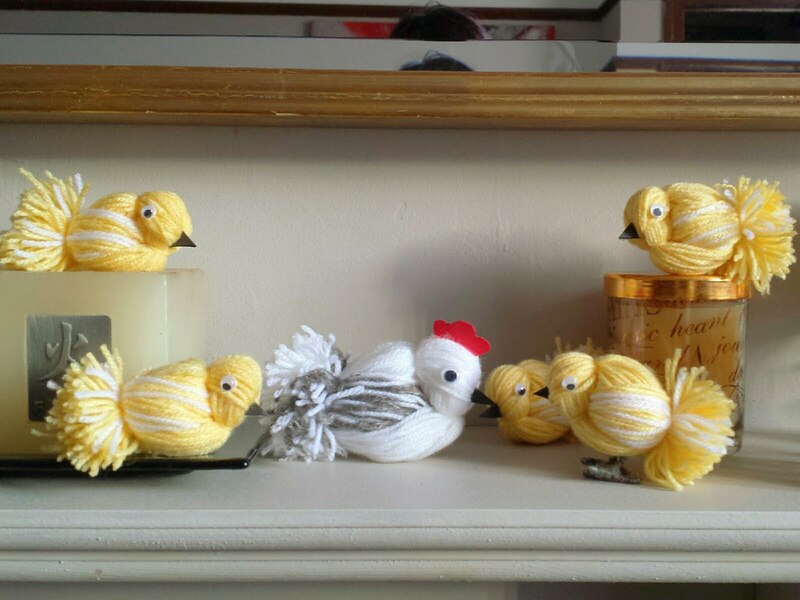 So after much time spent online trolling the crafting sites, I decided to start my Easter decor collection with a family of yarn chicks and mother hen. 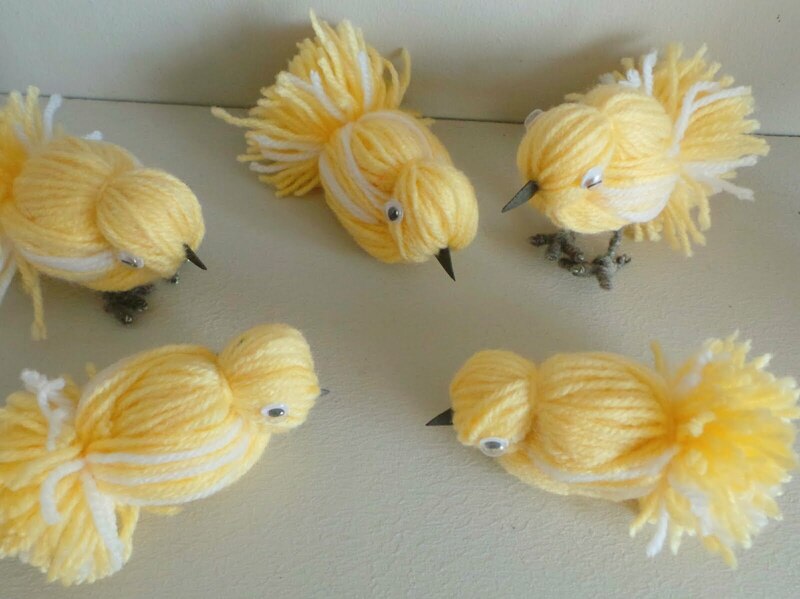 Making yarn birds is easy and quick, doesn't require special skills or materials, therefore a great craft to make with your children. m You can finish it in under an hour, perfect if you don't have a lot of free time in your hands. 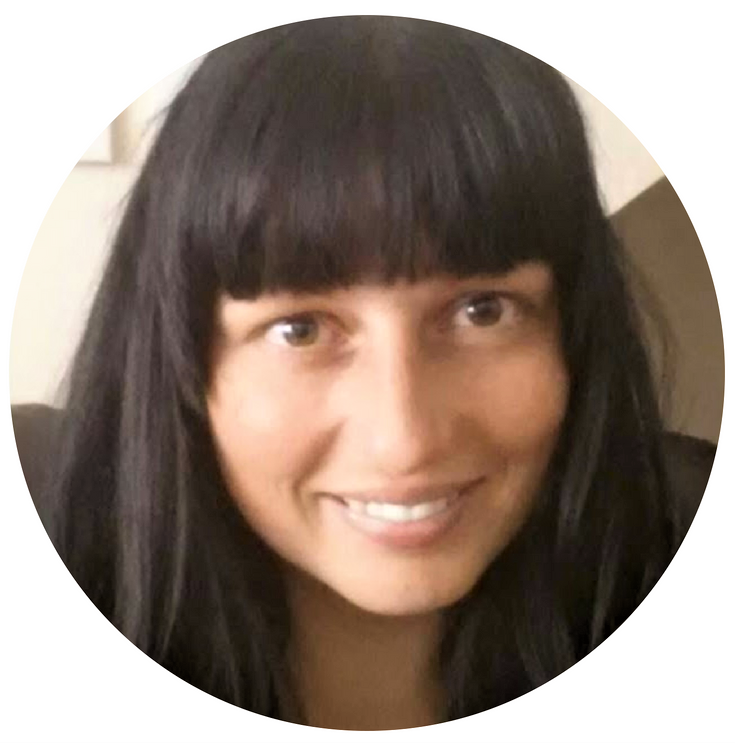 Before we start, please note that this post contains affiliate links, I will earn a small percentage should you choose to purchase something, but it will be at no cost to you. 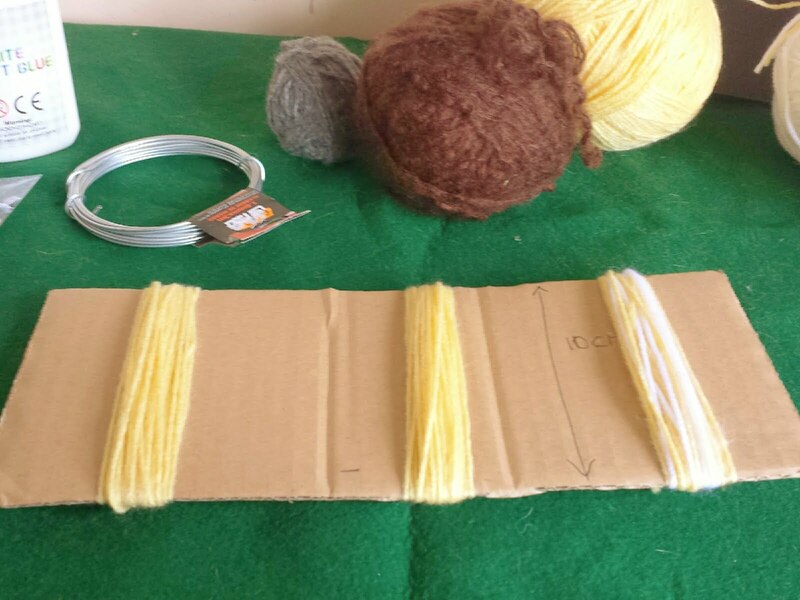 Start by rolling the yellow yarn around the 10cm wide cardboard about 30 times. Once done, cut it at one end and put it aside. 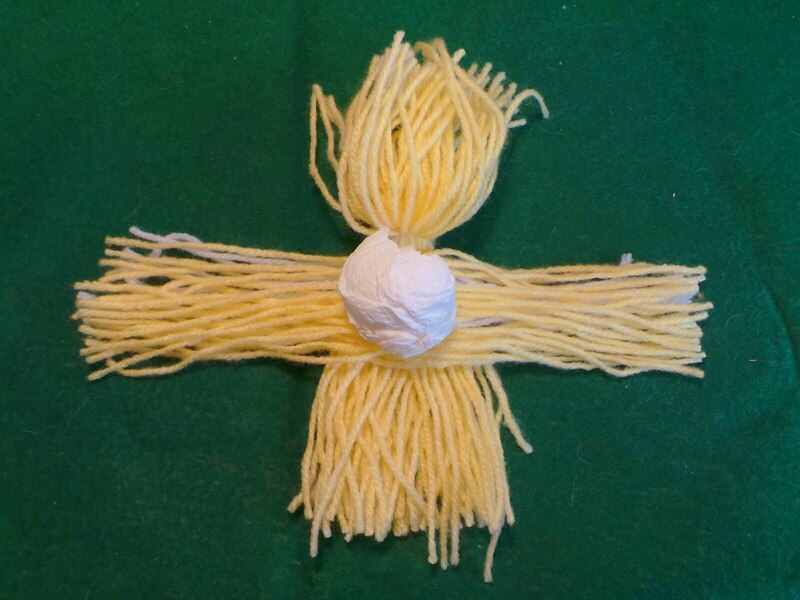 You need 3 of them, 2 completely yellow for head and chest and one yellow with some strings of white for the wings (roll yellow 25 times and white 5 times). 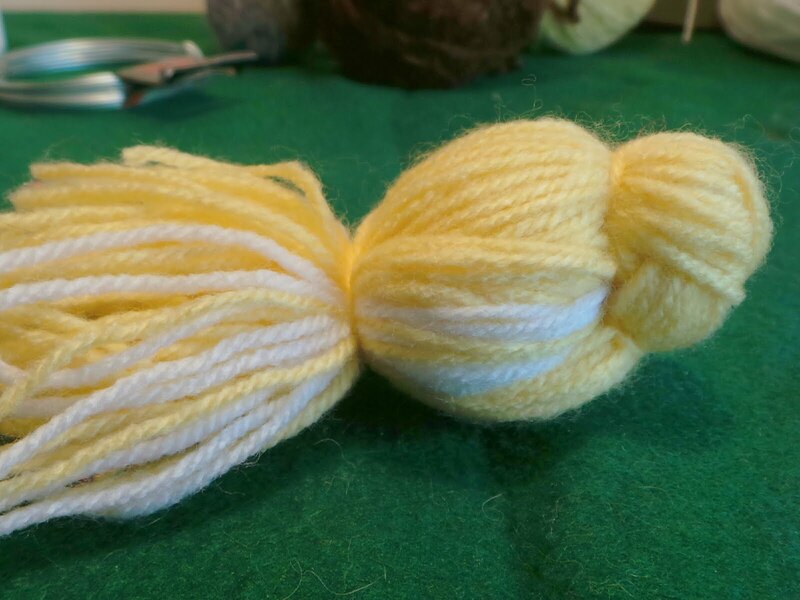 Take the 2 yellow yarn bunches and place them adjacent, one on top of the other. 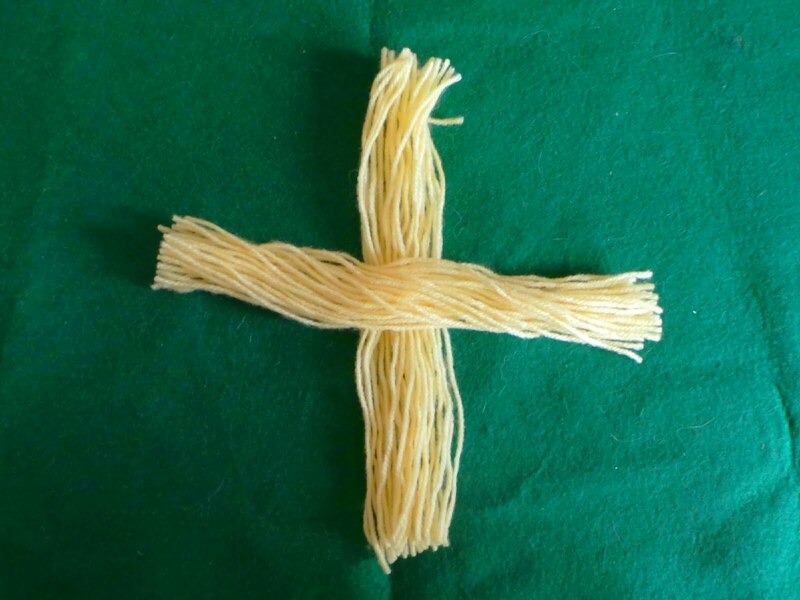 Fold first in half and tie it with a piece of yellow yarn. Tight. This is your bird's belly, bottom of head and chicks. 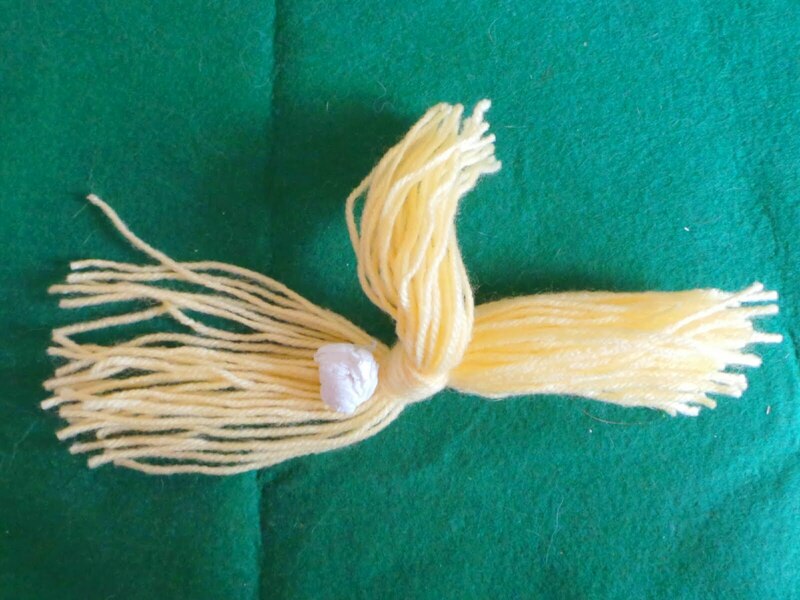 Now do the same to the second bunch, but before tying it, place a paper ball made of a quarter of a paper napkin square to form the head. This will be the back, top of the head and part of the tail. It should look like the picture below. 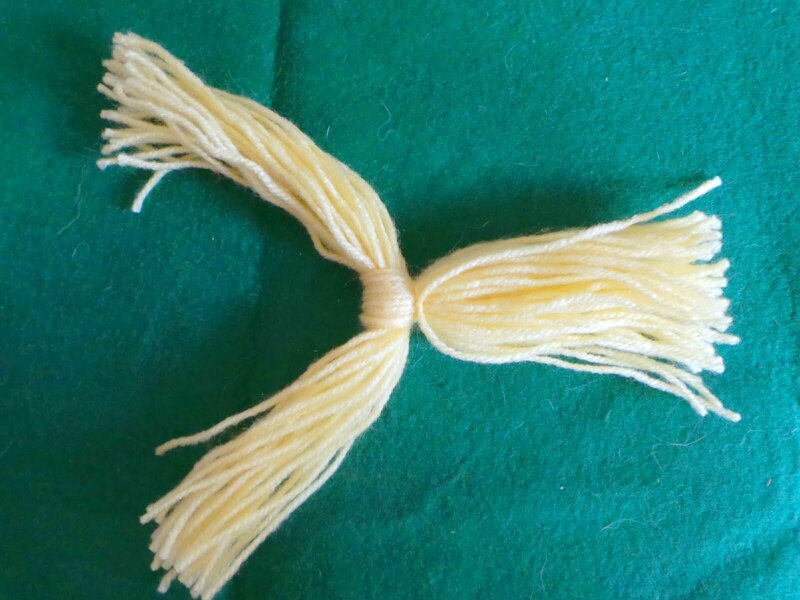 Place the third yarn bunch between the other two folded one, just like you see in the photo below, with the white strings facing down, it will form the wings and part of the tail. 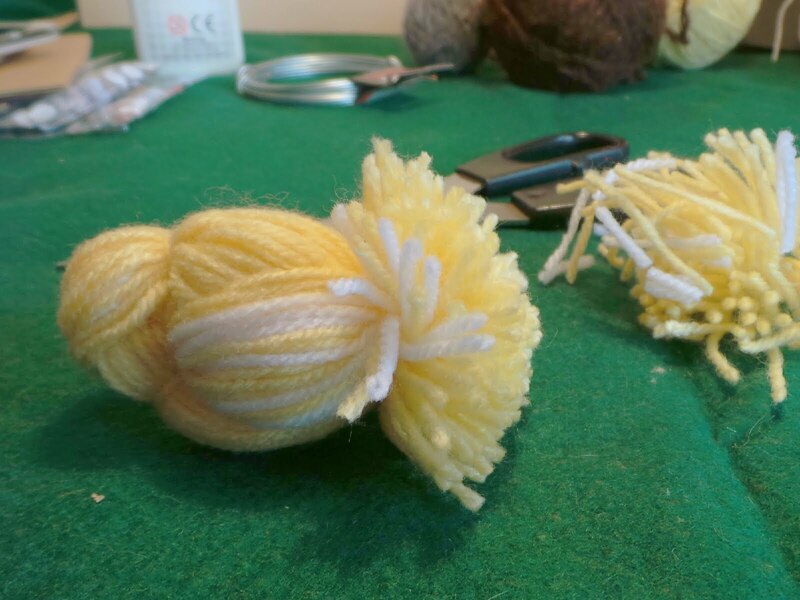 To shape the back of the yarn chick, form a ball out of the remaining paper napkin and place it on top of the third bunch. 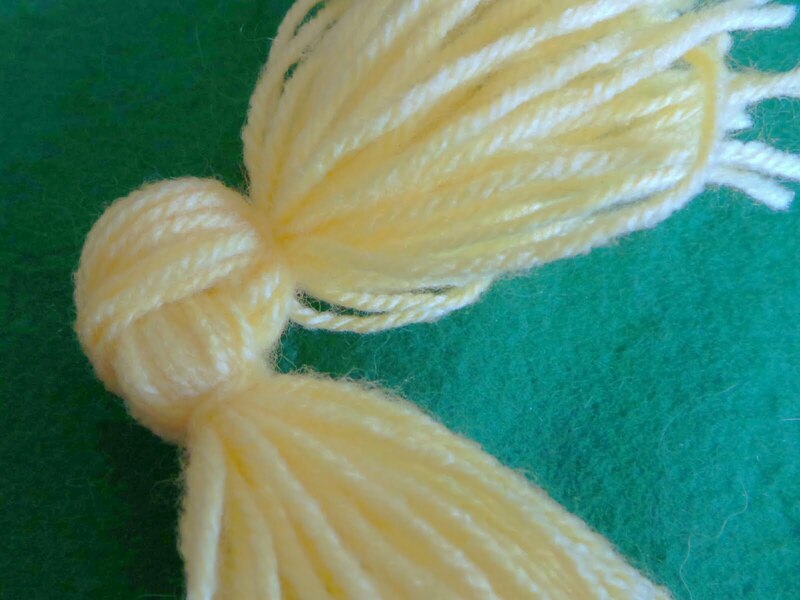 Now fold the second bunch over the ball, make sure you cover it completely and tie it tight at the tail. Fold the third bunch (the wings) over it. 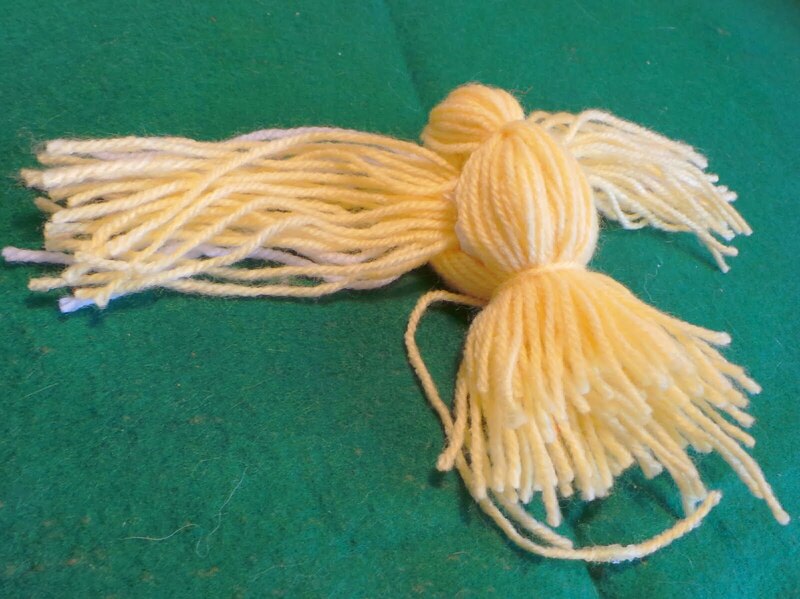 Now tie it all tight with a piece of yellow yarn to form the tail. And there it is, the chick's body. Now all we need to do is add legs, eyes and the beak. Use PVC glue to attach the googly eyes, unless they are self adhesive, mine weren't. For the beak I used black paper from which I cut a square 1cm by 1cm. I then fold it corner to corner twice and glued it to the chick's head. 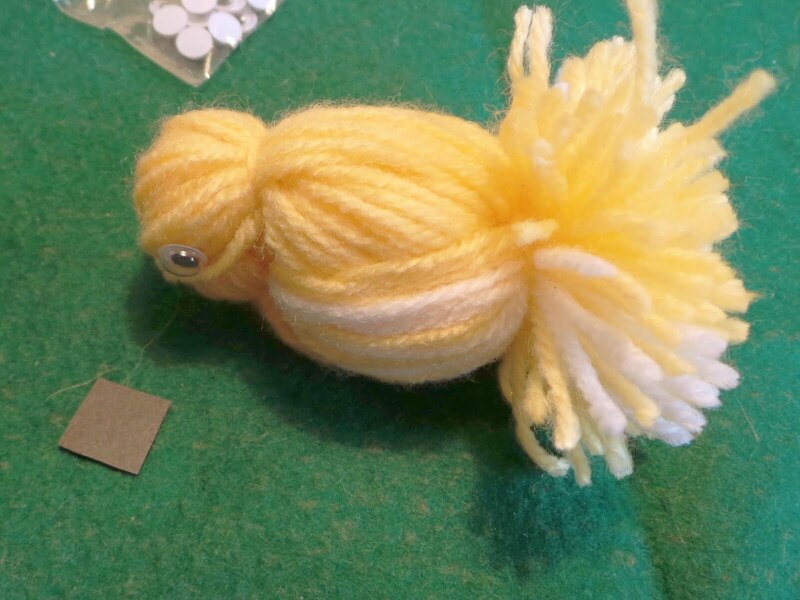 You can choose to skip making the legs if you want, the chicks will look good with or without the legs, but, if you choose to have them, bend them at different angles to position the chicks differently. I made some with legs and some without for you to see the difference. You can find the tutorial on how to make the legs HERE. Now make a bunch of them! 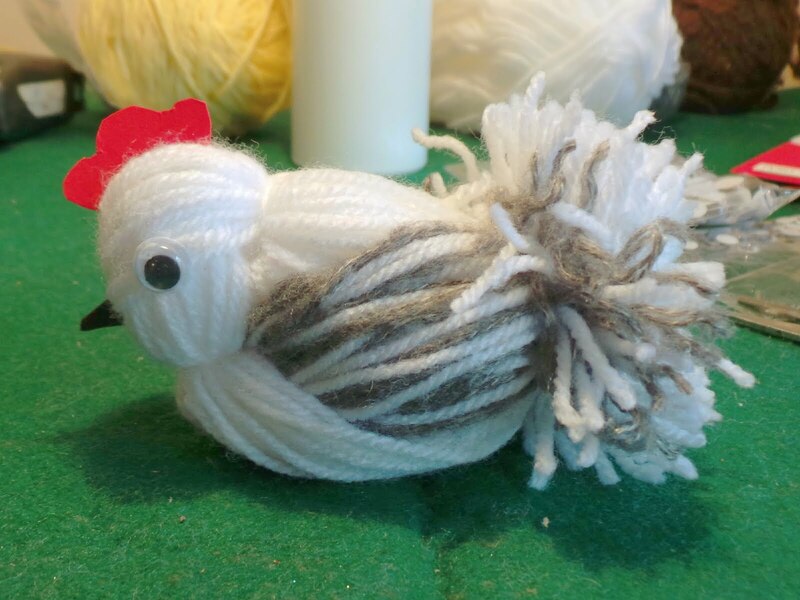 The hen is made pretty much in the same way as the chicks except it is bigger and it has a comb. 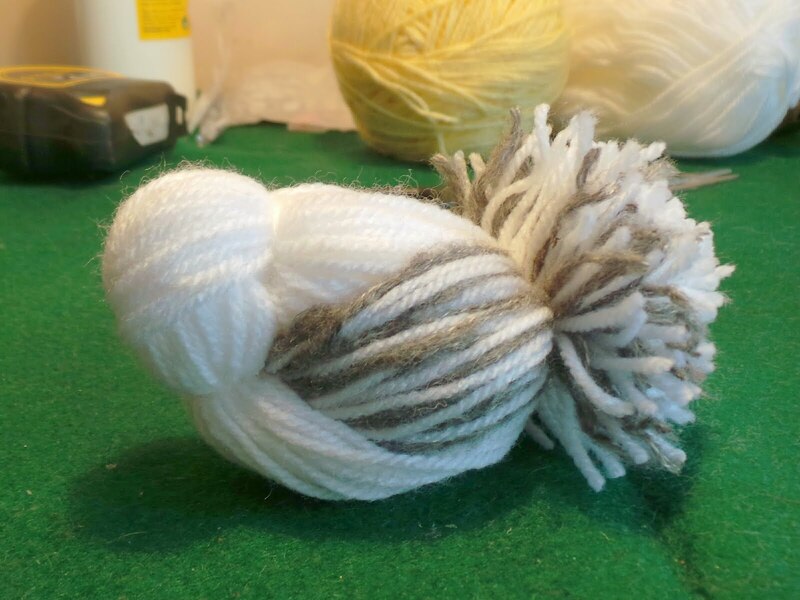 I also used white and grey yarn for her body. 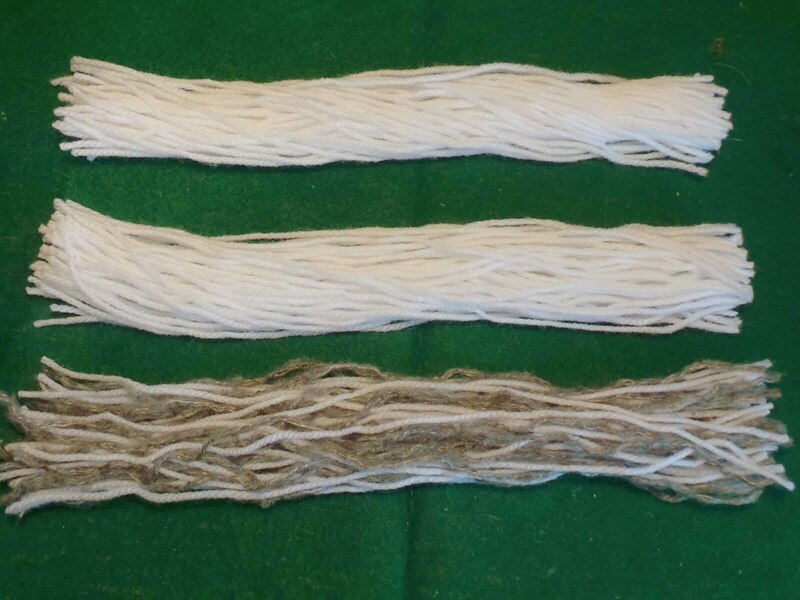 Use the 15cm wide piece of cardboard this time and roll around it yarn about 50 times to make 3 separate bunches. 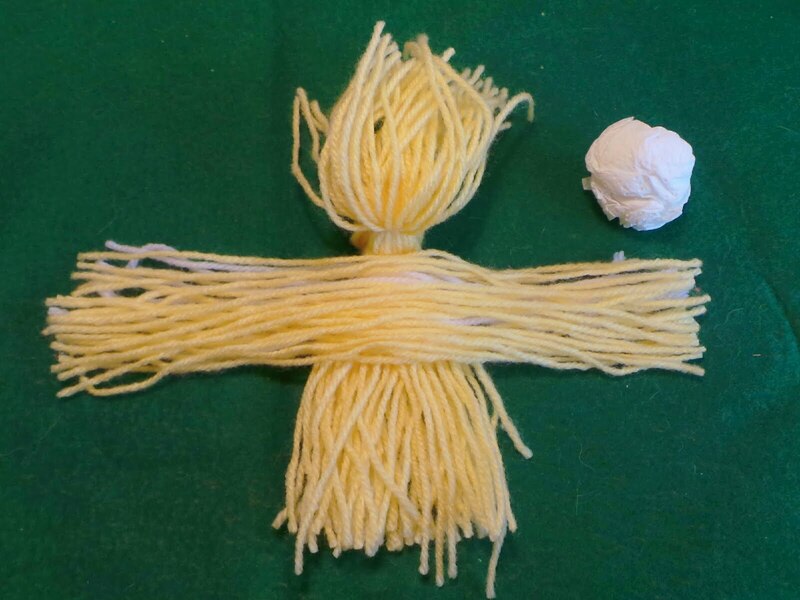 Make 2 whites one for the belly, head and back, and one white and grey for the wings (I took both strings together and rolled it 25 times, so it's 50%-50%). Follow the previous steps for making the hen's body. This time use a bigger piece of paper napkin to form the ball that shapes the hen's head (half a napkin square) and back (one square and a half). 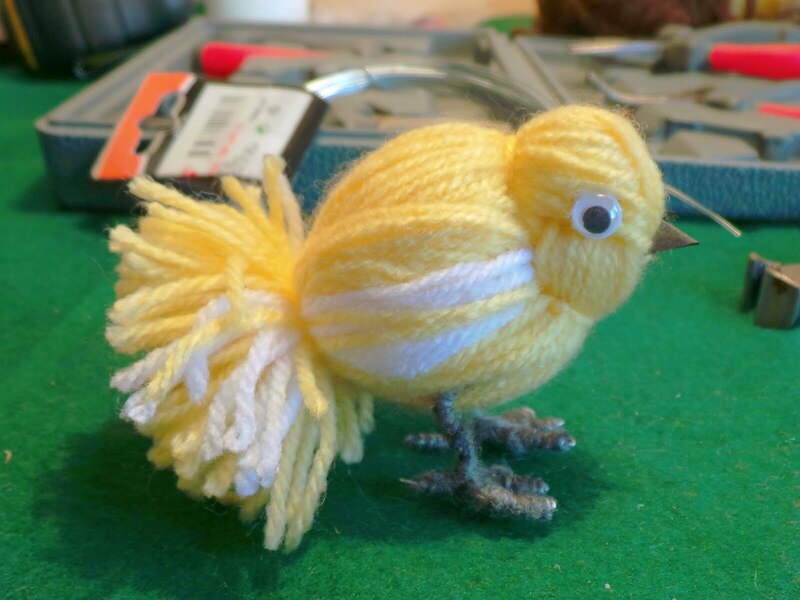 The end result should look like this, a bigger version of the chick. Draw the comb shape on red card stock and cut it out. 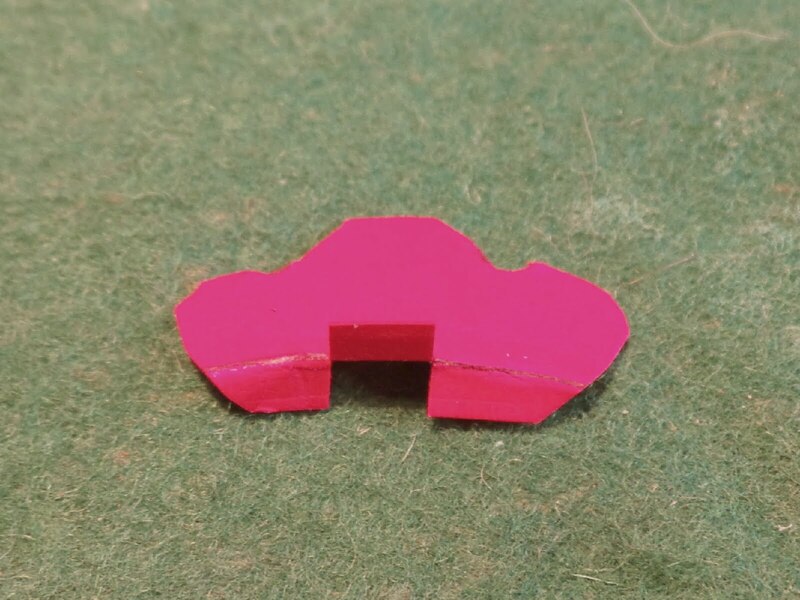 Cut the bottom and fold it as you see in the photo. 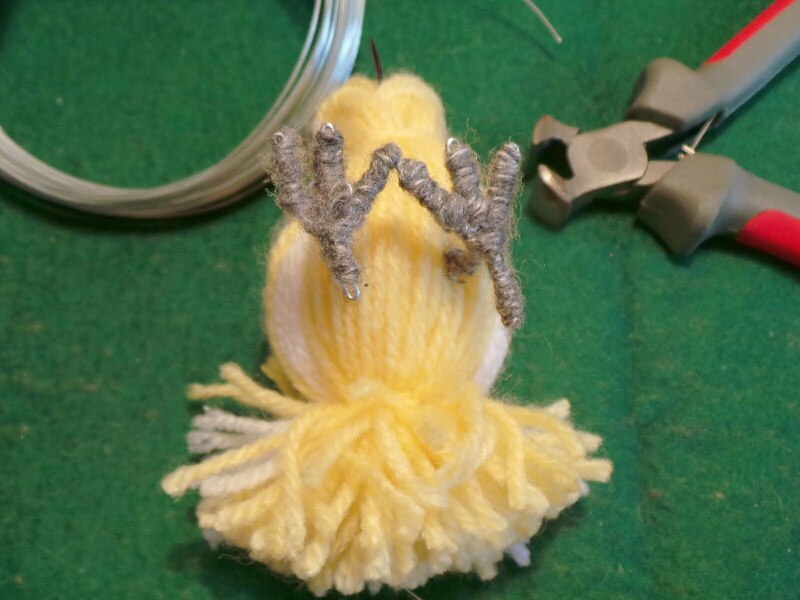 Part the strings on the head and glue the paper comb to the hen's head, the fold the strings over to hide the base. Form the beak out of a 2cm by 2cm piece of black paper folded twice and glue it to the hen's face. 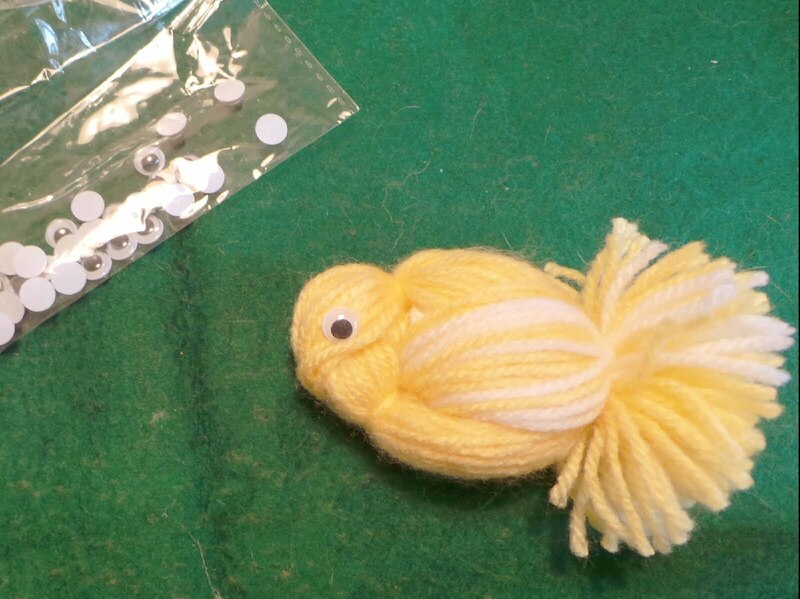 Then glue the googly eyes too. 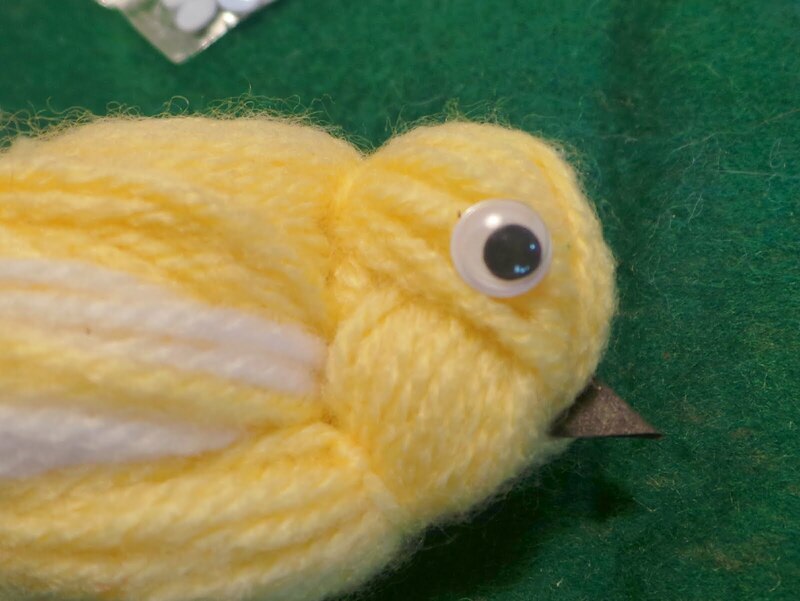 I used slightly larger eyes than the one used on the chicks. This is how the hen should look like once finished. 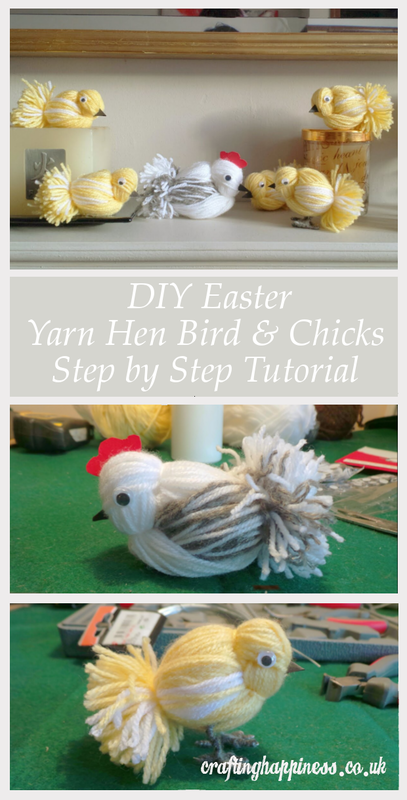 I chose not to have legs for the hen, but if you want yours to have legs, you can find the tutorial on how to make them HERE. 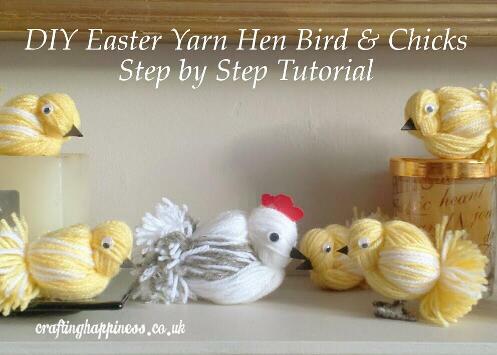 Make sure to build the legs bigger as it's a bigger scale bird than the chicks. And this is the whole family, some chicks have legs, some didn't need any. Now all you have to do is find a place for them. You can choose to place them in a basket, or on your table centrepiece, among candles and potpourri, or simply on the mantle piece like i did, the options are endless.